Always a tough question! I guess in nature, we always see different species fight, truly, it is only natural. Every bird, animal seems to want their own private space, food, family. I am sure in most cases, this is worth fighting for. 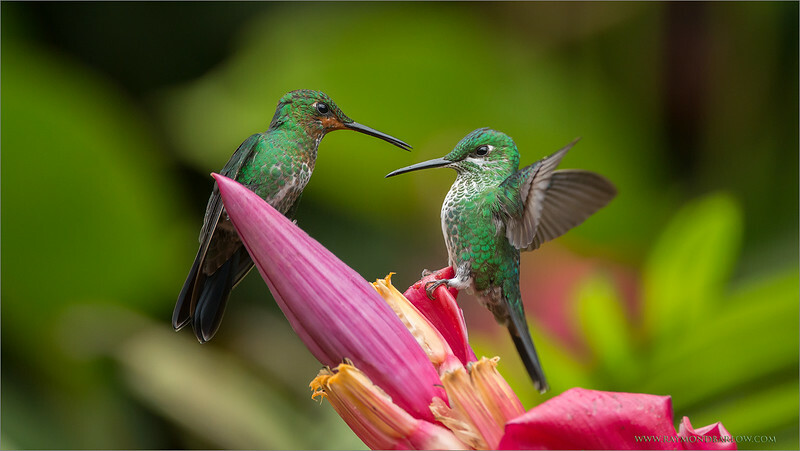 After hosting 15 tours to Costa Rica, mainly for hummingbirds, on my 12th program, I was able to catch a series of images with 2 birds in focus, and doing battle. I am sure I could easily do 100 more tours, and not capture such a shot! I think I have about 6 shots from this series, taken at 4 frames per second, so you can imagine how lucky I was !! Fiery-throateds are the ultimate squabblers. My guests are in awe with their beauty, and amused by their necessity to fight. 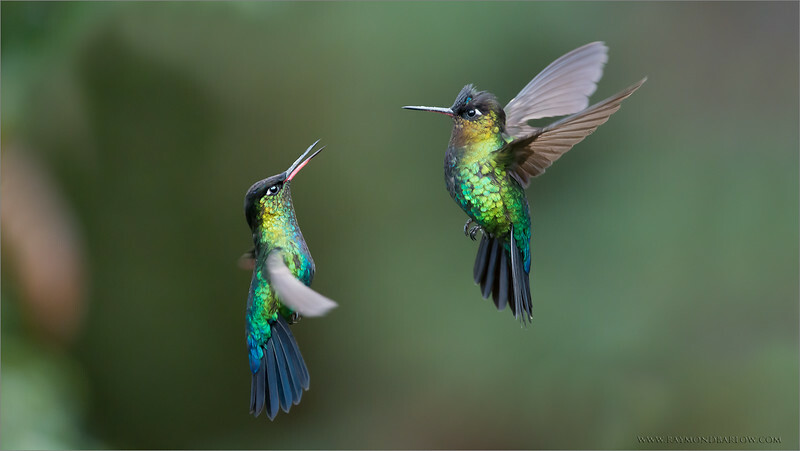 Two birds will sometimes engage in battle up in the air like this pair, then eventually lose their ability to fly, and end up on the ground, "duking it out"! It's funny when some guests will reach down to take the pair and separate them! When fiery-throateds get into these battles, the fight is so intense, people seem to have no effect on them, so we can actually move them apart, and let the birds go on their way. My facebook page - please "like". The technical challenge for Photographers! 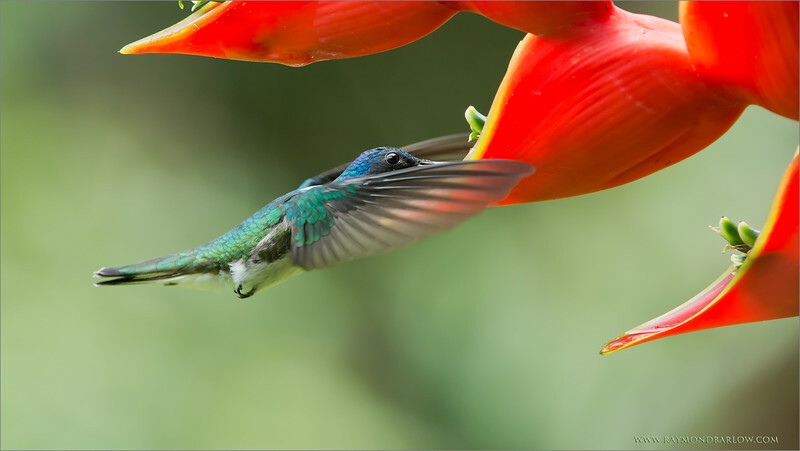 To capture a hummingbird in flight, with little or no wing blur. Personally, I like a bit of blur. To me it just looks more natural. I do not like flash for birds for this very reason., they simply look fake. When we are watching these birds buss around the flowers, our eyes and brains cannot be fast enough to freeze the wings, so a bit of blur is more natural. Once in a while, when I get lucky, the wings are caught in an almost still position, with a bit of blur.. as this image has those properties. Thanks for looking, I hope you will join me in Costa Rica some day! Waiting at least 10 minutes for this bird to take off was fun! Which direction would it fly? Being 100% ready every second is the key to success here, as this bird is very fast! 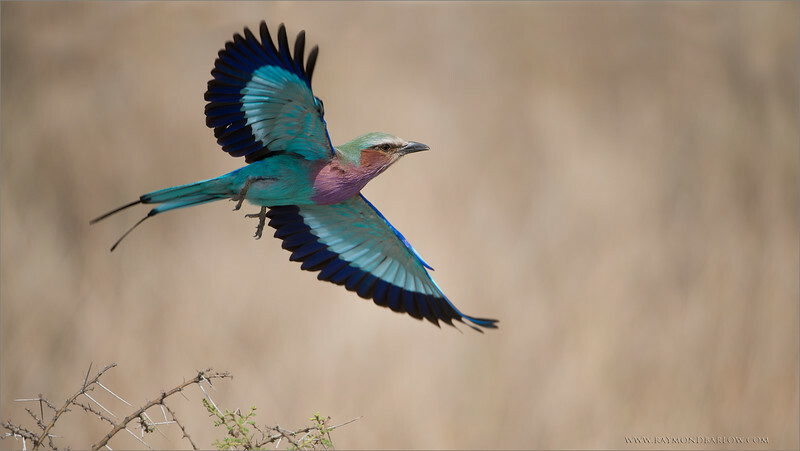 The Lilac breasted roller hunts from low positions, so it can see bug fly overhead against the sky. It will dart off the perch, race into the sky, and capture the prey! One of my top favourites, as this bird has wonderful colours. My next tour to Africa - pls click! 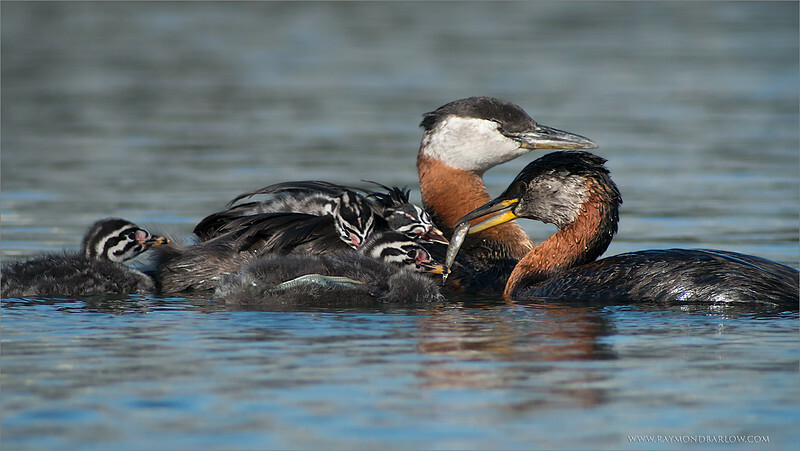 As beautiful as these birds are, they just can't get along! A light rain sets the mood, dark skies, and superb natural light! Amazing, some of these battles last a few seconds, and some will carry on for a full minute. To witness this event, very cool. To catch a shot of the action, even more fun! To share it with people who love nature is a wonderful part of photography. Thanks to everyone for clicking on my images, very much appreciated! Please respect nature! Join me in Costa Rica! Sometimes we are soooo Lucky! 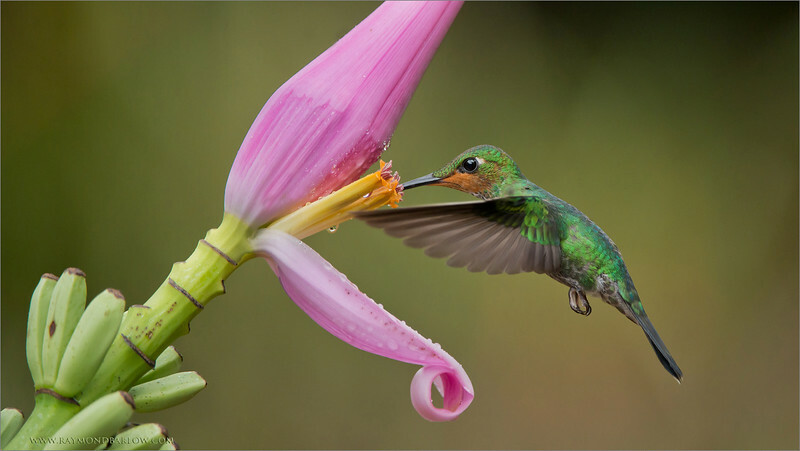 To catch the flower and one bird sharp is one thing, but 3 birds sharp, and a flower, and a bug - Luck! 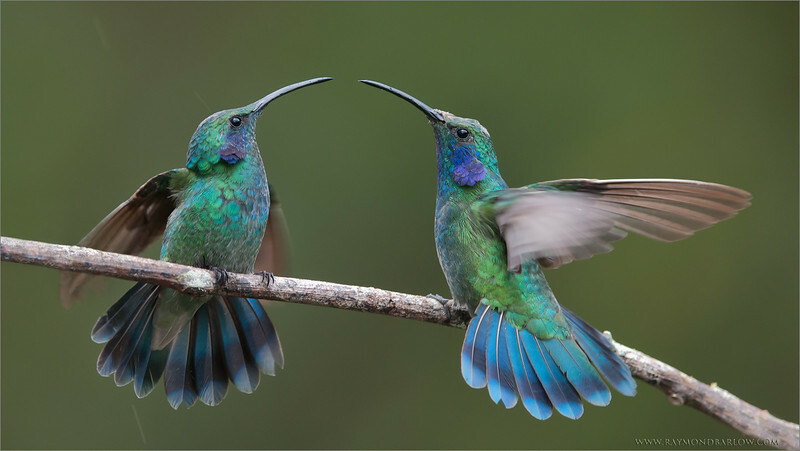 The bird on the left is a Magnificent and the two on the right are Fiery-throateds. Safe travels this week, hope all is well in your life. Please help us all respect nature. 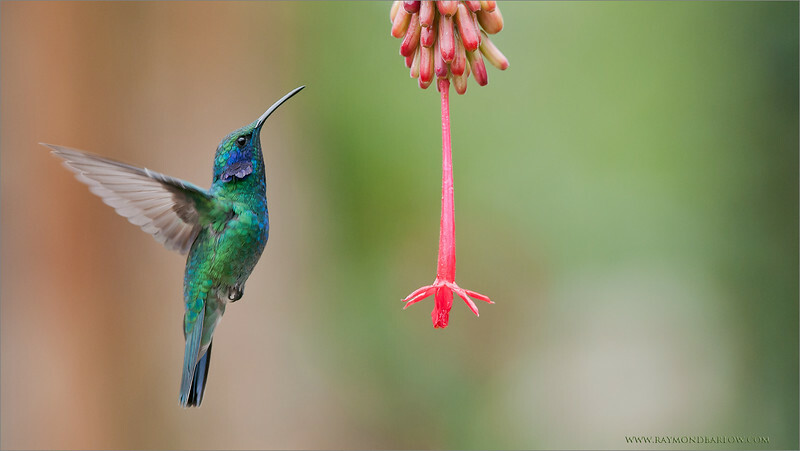 Watching this bird "dance" around the flower is a spectacle of nature. To be able to capture the sense of what I see through the lens is much more then a technical achievement. 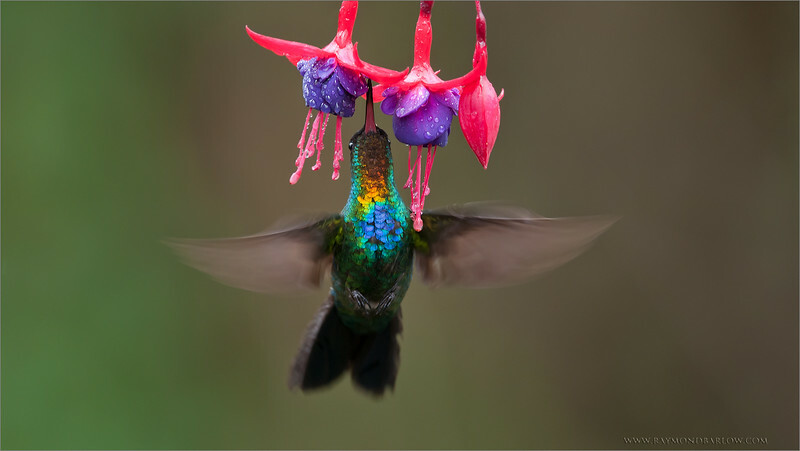 After posting many images of hummingbirds here on so many websites, the feedback has been overwhelming. People enjoy the beauty, and the sense of freedom. Imagine - all they need to do is visit a flower once in a while, and rest, what a life! What we don't see in the images is how much they fight! 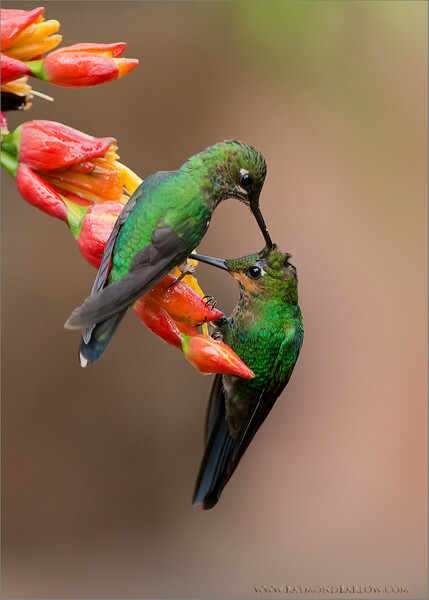 A dominant bird will tale over a flower, and not let anyone else in for a drink. This is the real nature of these birds. They can be very nasty! All natural light, no flash ever used. As a photographer, we share the pretty side, as a naturalist, we see the reality. for me, the fun is presenting the nasty side too... in some of my previous images. Today is Canada day, enjoy the holiday Canadians, hope the weather is good in your area! After hosting 15 tours in Costa Rica, and many more tours to this awesome country, I plan to visit Ecuador for a different series of workshops / tours. 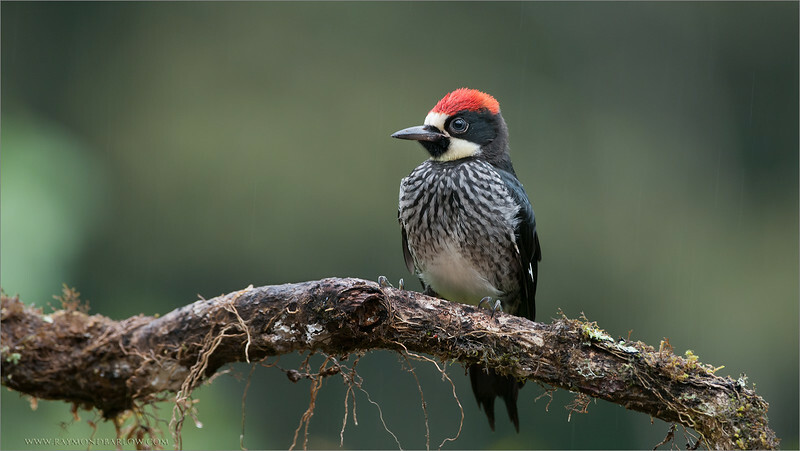 We will visit 2 different lodges, and photograph several new species of birds. I spent an evening recently with my family at this nesting site... 400 images later, and thanks to Swarovski Spotting Scopes, we have a few images to process. Very difficult shooting but good fun! Hungry Mouths need to be Fed! have their work cut out for them to keep the babies feed! Special thanks to Swarovski Spotting Scopes. 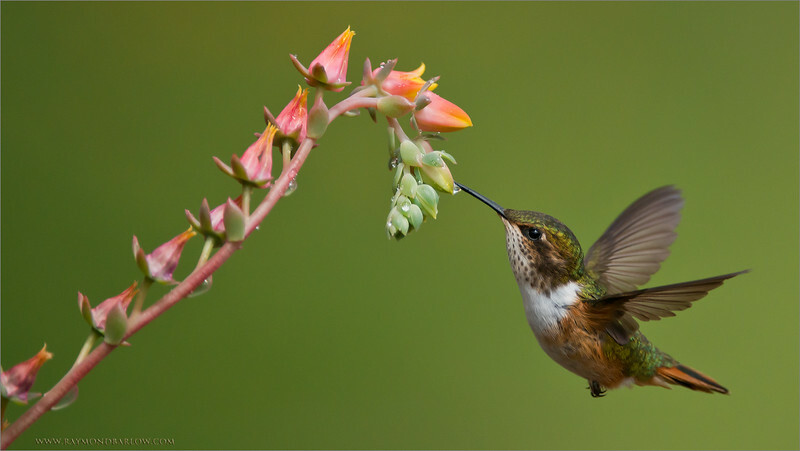 A bee is coming in for a landing at the same time as a Hummingbird! Such contrast., bright pink and yellows, dark black - green background, dark blue bird, and some action! I hope you enjoy this image. 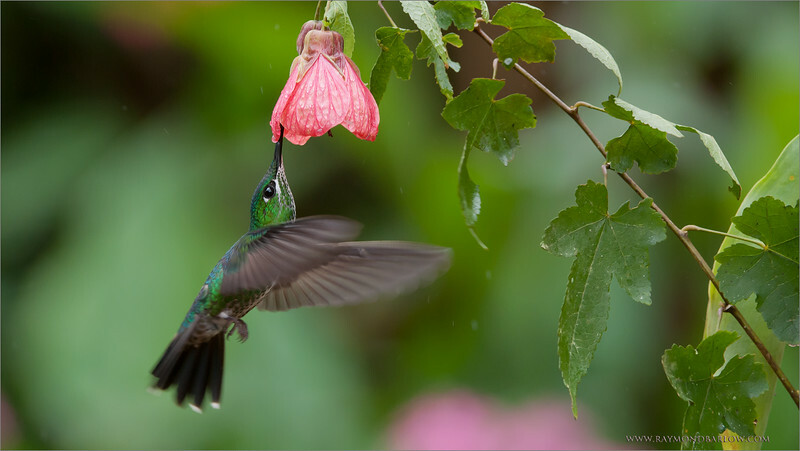 this is the largest hummingbird that we see in Costa Rica! Thanks to everyone for 10 Million + views! So much appreciated. Please share, and follow my work if you wish. my G+ profile here..
Have a great weekend Canadians! Happy Canada Day coming soon! 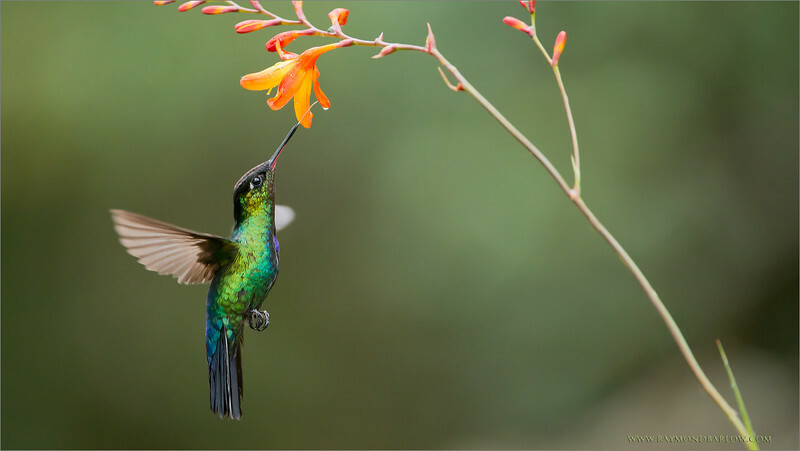 - A hummingbird's tongue is 2 times as long as it's beak! 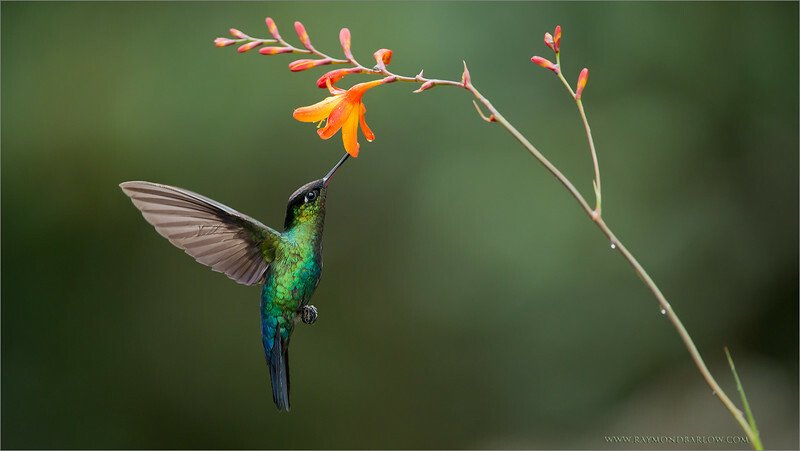 - A hummingbird can eat 2 times its weight in a single day! 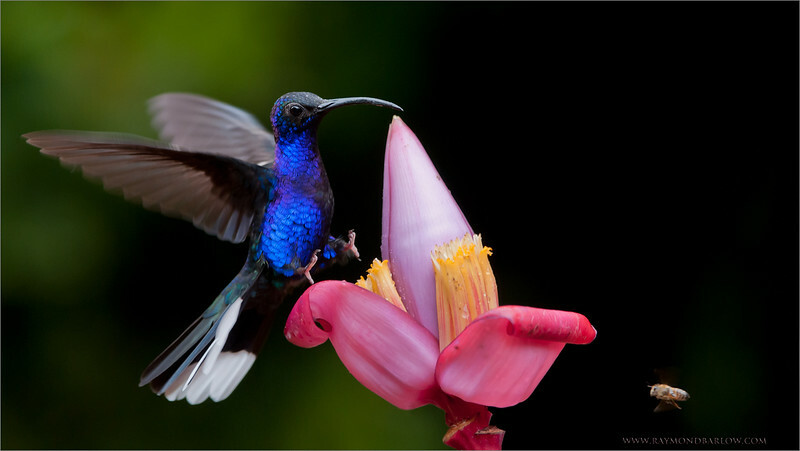 - A hummingbird has both legs and feet, but cannot walk! 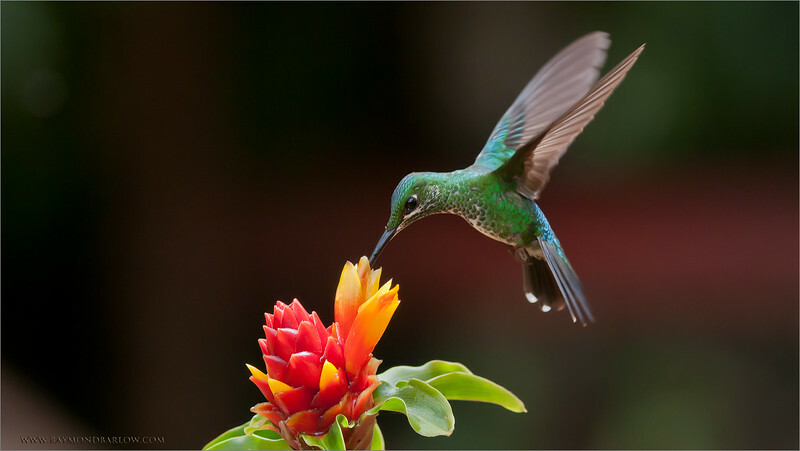 - A hummingbird is the only bird in nature that can fly backwards! But what amazes me most is their ability to navigate while in flight.. at super high speeds, with twists and turns that can be so incredible! While photographing this beautiful female feeding, the pouring rain was caught bouncing off her head! Besides the water, I liked the fluffy view we can see with the underside of this hummingbird. When we visit this location, these birds land on our hands, our heads, our cameras, so the intimate trust is so very cool. We feel their tiny feet on our finger, then their curious look into our eyes, as these birds wonder 'what the heck is this person doing?" The adventure continues, so much more to learn about nature. I love hosting photography tours! truly is a key to success for the nature photographer. Part of my job while on these tours is to assist my guests with the creativity involved as we try to make images that are sharp, and with fine details in composition. To get everything just right is worth celebrating, with you, the viewer! I hope you like this shot, as with all the nice comments, +'s, and shares, I am motivated to try harder next time. Best wishes for a wonderful week, please do not abuse our natural world - let's all save and protect! If everyone in the world did a better job taking car of our waste, we all will enjoy a much better place for our families to live with nature. A Positive Attitude + India! A good disposition will go a long way in nature photography. My first step is to visualize the image, then do what it takes to create the shot. Much like the game of golf! 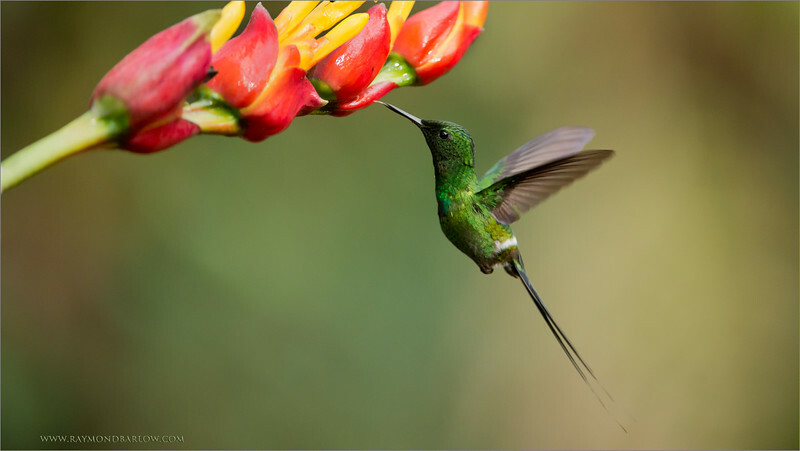 Concentration, focus, technical knowledge and creative abilities all merge here in bird photography. I work with 100% natural light with all my imaging as ... nature = natural light. The challenge is the fun! Sharing the end result with my friends is the icing on the cake! Even better, folks want to learn photography, and come to my programs to see how I do all this! Please join me! Tour India and photograph the Bengal Tiger!! Please click here for info. Special thanks to my friends Thomas Vijayan and Mohan Thomas for sharing their superb Tiger images with me! Thanks to all of my recent guests who have supported my business on these tours, as the fun and photography has been wonderful. Please respect nature, and take care of our world! All natural light with every image you see in my galleries. One of my favourite locations to shoot! A small village high in the remote mountains, on a coffee farm. This area is called a cloud forest. usually some sun in the morning, then cloudy, then some rain. Misty, mountains, fog, moss everywhere you look. Old growth trees, narrow rocky dirt roads, boulders!, farms in the hills! The nicest people you can imagine. After 15 tours, and at least 3 nights at this coffee farm on each tour, I have become close friends with the owners, they are such sweet people. Home cooked food, fresh from the garden veggies, cooked on a wood-stove. The best coffee you can imagine! So quiet and peaceful. A small river runs through the area, creating incredible scenes for the landscape photographer. the water rushes so fast down the hill, you can here it a mile away! Thanks so much Costa Rica for being so good to my guests, the beauty is everywhere! to catch for any kind of shot! They fly like a bumble bee, dance around the flowers with a very quiet, and non-aggressive posture. 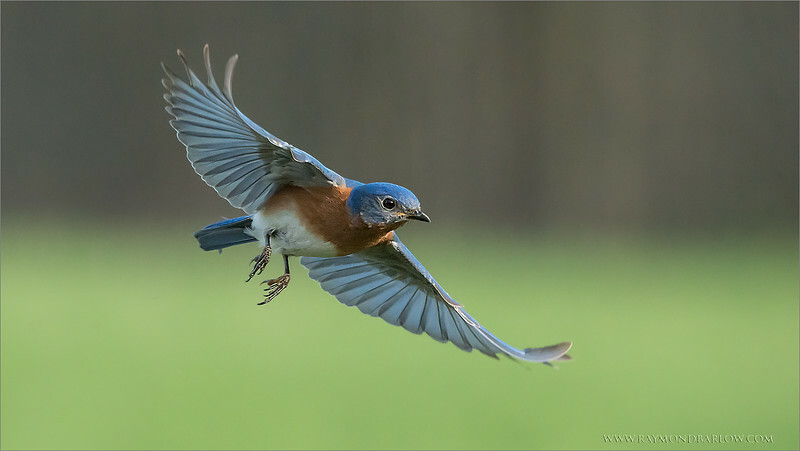 The other birds chase them away quickly, so it takes a very determined bird to have a chance! 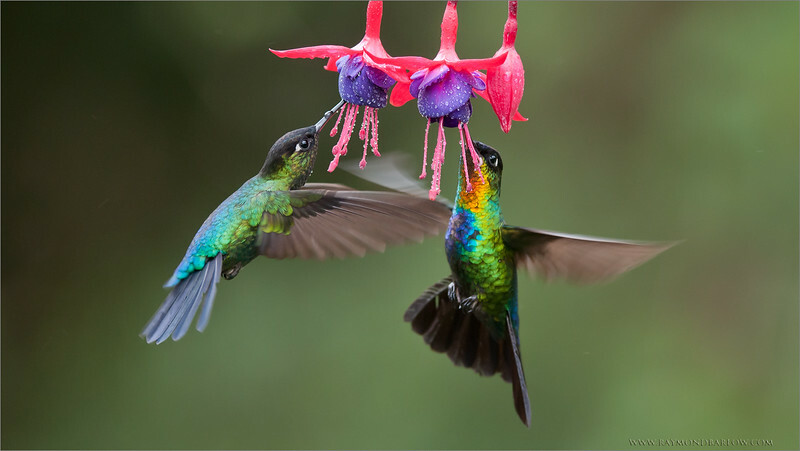 At this location we find up to 10 different species of hummingbirds, the fun is watching them interact, and jockey for position on the flowers and feeders. Thanks for looking, and sharing my images! Private tours for small groups available! Green Crowned Brilliant Family - New hairstyle! - Join me? click this link and see if anything interests you! Thanks for looking and sharing my images! A Green Violet-ear comes in for a landing on a perch.. while I was not even looking through the viewfinder, I was very lucky to catch the shot! This area was crazy busy with hummingbird activity, so I stayed focused on this branch and waited for the right moment. Dark rainy conditions warrant a higher iso value on your camera, all the new full frame equipment seems to perform well in low light conditions. The beauty of natural light shines through your lens, with natural colours, and a realistic view of the scene. Looking forward to more private group tours to Costa Rica! Thanks to the Forest City Image Center in London Ontario, and Swarovski Optix for allowing me to be present at this fun event. On Sunday June 8th, 2014 we had falconers birds at the Circle R Ranch, and a chance for photographers to use this Swarovski Spotting Scope to take photos with their DSLR cameras. Special thanks to Tom Baney of Swarovski, and Antony Ghodas of Camera Canada for all the help! This beautiful bird posed for everyone, and was truly a spectacular site. I am already looking forward to next years event! It's a very long story. July 31st, 2003 my brother Geoff and I traveled to see a great friend - Mark Dionne in Wellfleet, MA, on the Cape. With my boat in tow, we planned on a scuba diving trip, that changed when Mark told me there were humpback whales in the ocean, and we could possibly see them. Long story short, we had an incredible experience, overwhelming! My Sony point and shoot didn't cut it... so off to my friends camera store, "Camtech" in Hamilton Ontario, to buy my first DSLR. A couple months later, a 70-300mm and I was on my way down the wonderful road of bird and wildlife photography. That whale experience changed my life. A week later, I met my sweet wife Daisy, and started the photography challenge of a lifetime. Bird photography is very difficult. I saw Peter Darcy's images of owls on a website, and the spark was aflame! 10+ years exploring this passion, and I am learning all the time. The most important "thing" you gain is an appreciation for the beauty, and fragility of nature. I personally feel a responsibility to express how important it is for everyone in the world to show respect. Please leave wild animals alone. Do not feed Carnivorous creatures, from owls to crocodiles, they should be left alone and not influenced by human feedings. Bears, wolves, lions, sharks, on and on - they are extremely dangerous, even monkeys. 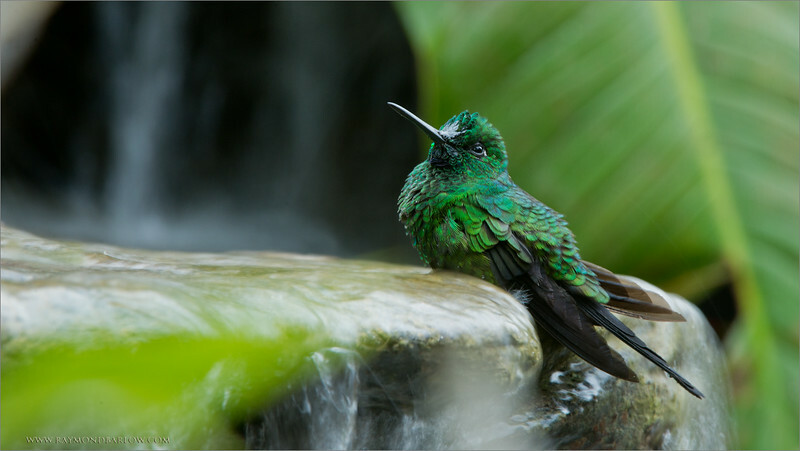 Acclimatizing these animals and birds puts them and us at tremendous risk. Keep your distance! You cannot pose for a photo beside such birds or animals. So long as I am sharing images, I will ask folks to listen to these messages, and treat nature with respect. Please share this information with your friends, and your respectful thoughts below if you wish. best wishes from Canada - Raymond. ps. please follow this page if you wish! 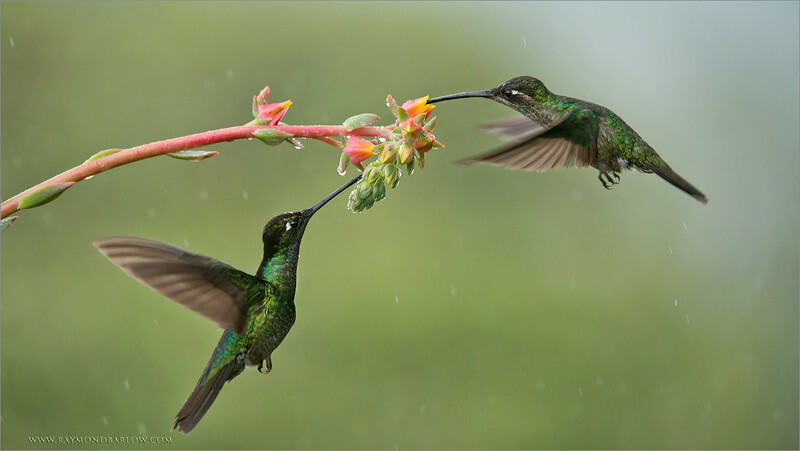 This pair of Magnificent hummingbirds enjoyed a meal during a rain shower! Fortunately, for us photographers, our locations have cover to keep us and our gear dry! For the birds, this is bath time. Working with natural light always seems to be the best possible choice, even on a dark rainy afternoon. Thanks for viewing and sharing my images here in G+, very much appreciated! 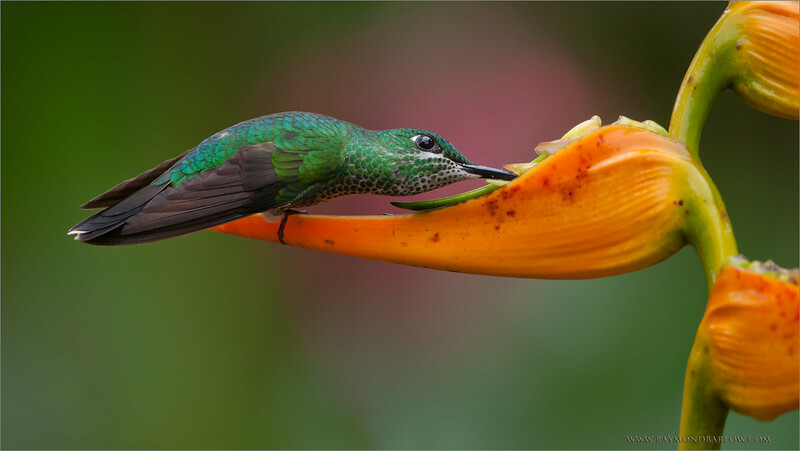 To watch these hummingbirds enjoy a meal is so much fun! 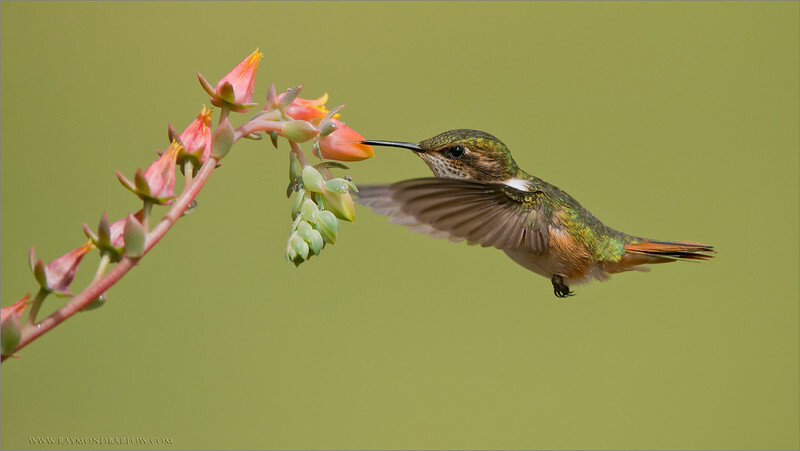 Photographing hummingbirds is a spectacular way of enjoying your day. Each bird has their own special features that we try to capture. Travel to Costa Rica is easy, and very safe. I meet all my guests at the airport, travel to a very special hotel, then off shooting right away - if we arrive during the day! The best part of this job is teaching each guest, and helping every photographer improve their skills. Small groups, and lots of shooting can be very rewarding! I never take more then 4 people to Costa Rica. The colours of this fiery-throated hummingbird are amazing, at a certain light angle, the throat feathers reflect so many nice iridescent tones. No flash is ever used for any of my wildlife photograph... natural light works. Thanks for looking, more images from my previous tours soon. Enjoying nature is a special time, so much fun to see and photograph. Sharing these images with you is such a privilege, my last image here on G+ went out to almost 278,000 people! thanks so much to everyone who +'s, comments, and shares! I hope you will enjoy this recent edit, many more to come. Recently, I have set up a tour to India, for 12 days of tiger photography, in November 2014. This is going to be one very special tour, with incredible opportunities to photograph the spectacular Bengal Tiger, and cubs. Up to date info is available via email. 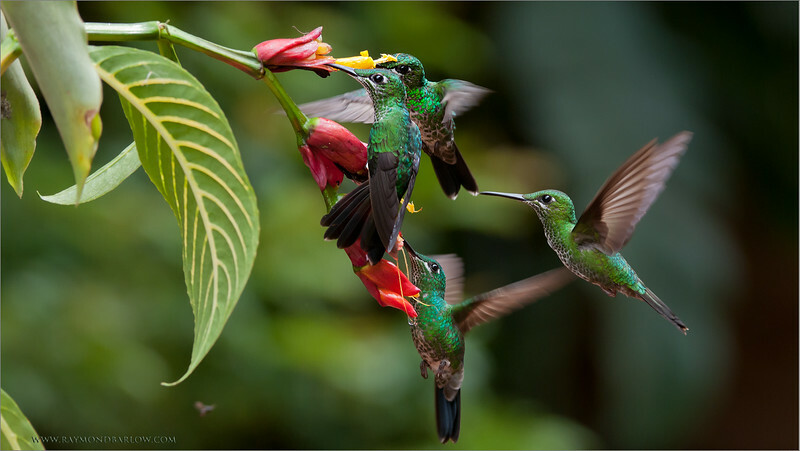 We also have private tours ready to be booked for Costa Rica, with small groups, maximum 4 people. This ensures a very interesting, and productive experience. I hope you and your photographer friends will join me soon! Thanks to everyone... it is great to have 15 tours now completed to this wonderful place of nature and colours. 4 Females in Focus! - Amazing Luck! These 4 beauties were all feeding on this flower at once, and somehow they all hovered on the same focus distance, and parallel to my sensor. No cloning, or any special photoshopping, almost full frame, slight crop for a 16/9 ratio. Thanks to nature for providing us all so much beauty! thanks to you for looking! Working with colours can be great fun. 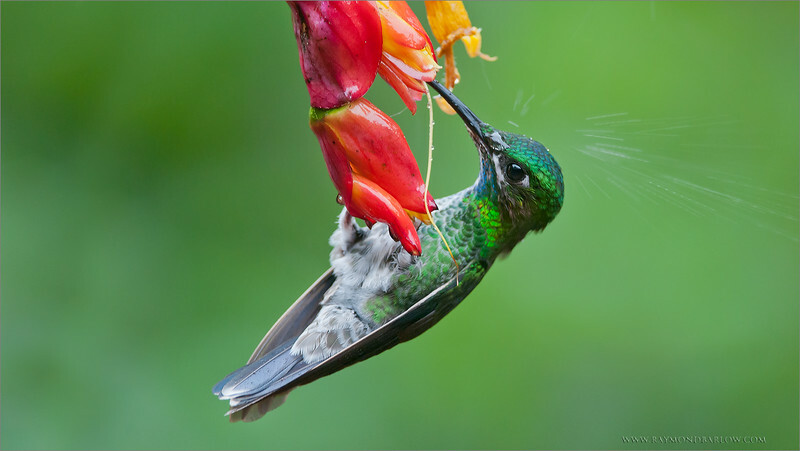 In Costa Rica, there is no limit to what we have to choose from - colourful birds with colourful environment. Enjoying such an opportunity in a rain shower can be even more fun, with the water creating such saturated colours, without the bright sunlight. Since I never use any flash, the natural light here is so sweet, and amazing nature provides all the excitement! And my first good look at the elusive Howler! This was fun, up high on a viewing platform, looking down to two amazing monkeys feeding in the canopy. Interesting to see the underside of the tail in this shot, with the "leathery" finish, rather then a full coat of fur. - thanks to my guests.... and especially my great friend Naseeb, who joined me all the way from Tanzania! 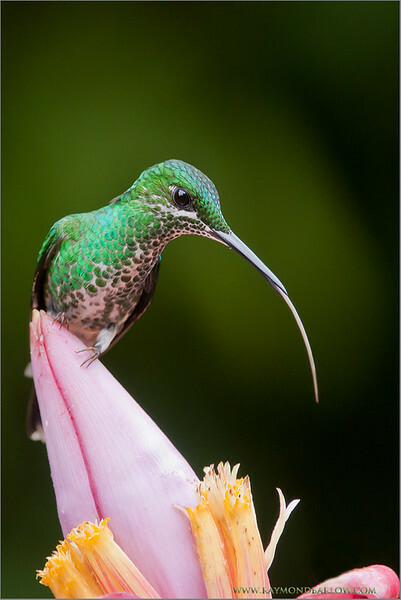 Lots of Hummingbird images coming soon! Please respect nature, integrity is always what comes first for my workshops. A recent tour with several guests when extremely well when these beautiful birds came to us for a visit! 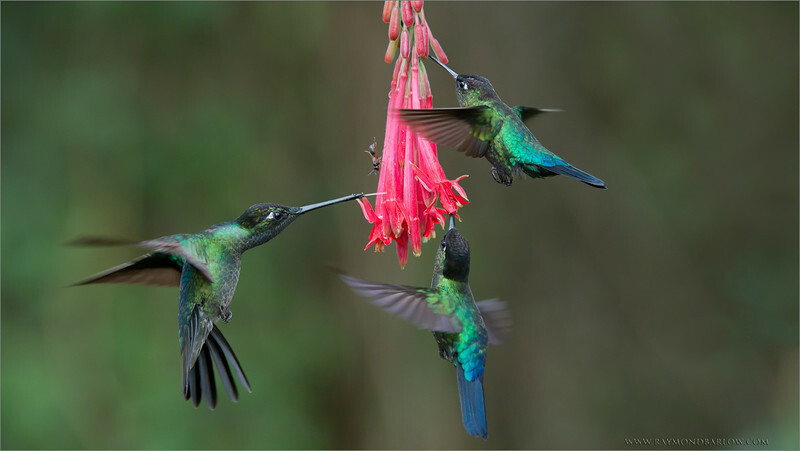 At least 60 hummingbirds from about 7 different species entertained our group for an entire day! With the light constantly changing in the cloud forests at almost 9,000 feet, the exposures are challenging. this image was a titch dark on the Raw file, so I was able to make corrections in CS5 software. Never using flash, and loving natural light is the key here, my camera gives me nice resolution at 1600 - 2000 iso, so just enough shutter speed to make this work. At 4 fps, I was able to capture 8 sharp images of this scene, so since the tougue was extended for this shot, I figure this one was the image to edit. Please respect nature, and the environment, please do not litter, or destruct the home of these beautiful creatures around the world. 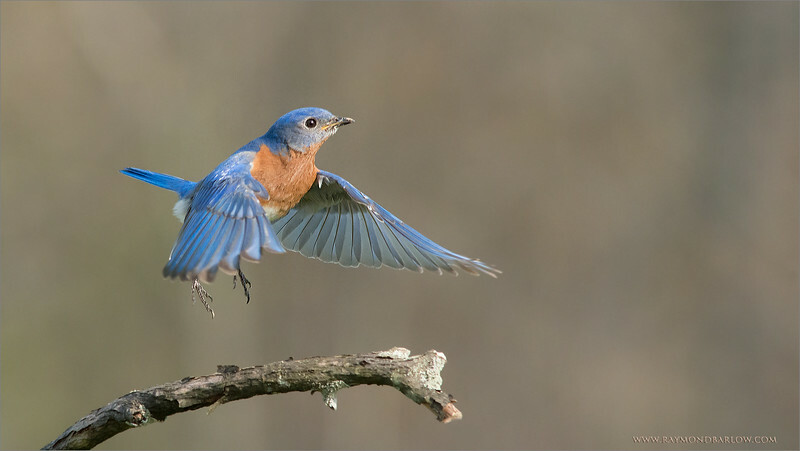 A wonderful male Eastern Bluebird lifts of his perch for higher ground! Local workshops are great fun. Little travel, one on one programs that help photographers learn how to work with nature, and enjoy the beauty. A lot of suggestions, and recommendations for all aspects of wildlife and bird photography, especially talks about ethical nature photography. Helping people understand the reasonable limitations on what we should and should not be doing in the field is an important part of my program. Such a beautiful bird to see and photograph. A hidden gem in the back roads of Ontario, these birds have struggled to survive. 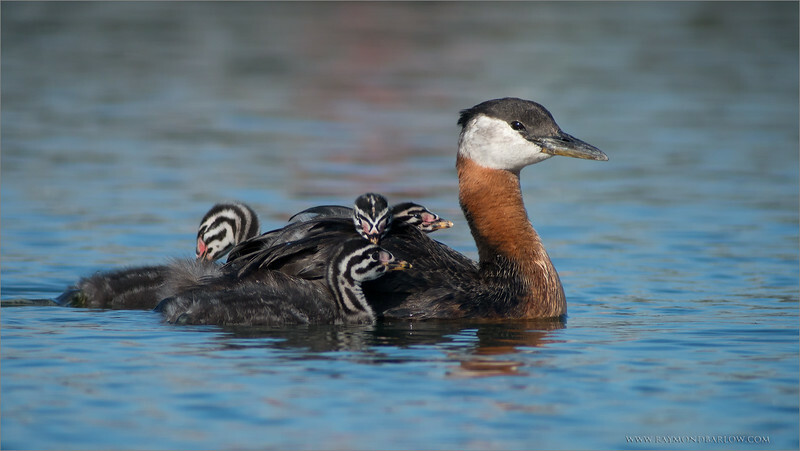 Dew to the amazing efforts from so many caring individuals, the species is on the rebound. 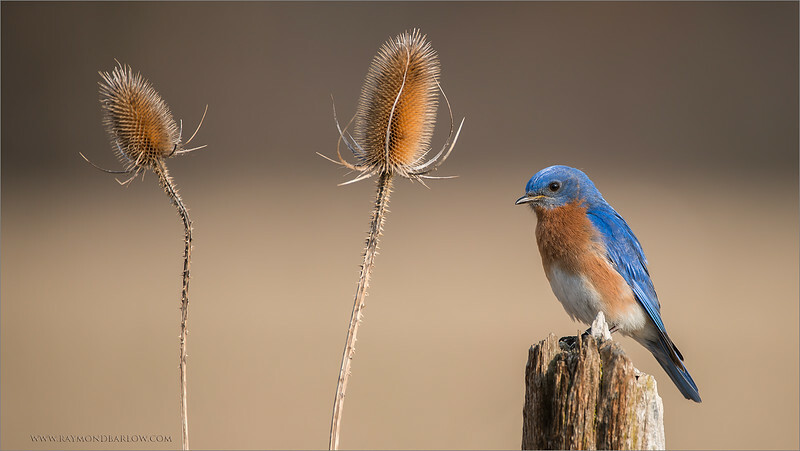 Bluebird boxes are maintained all over Ontario, to help these birds find a place to nest, as so much habitat loss due to urban expansion, and farming. Iso 6400 for this shot gave me a high shutter speed, enough to minimize blur. More noise than I like to deal with, but still a decent image quality with some noise reduction techniques in post processing. Have a good week, please respect nature and all of our beautiful natural world. 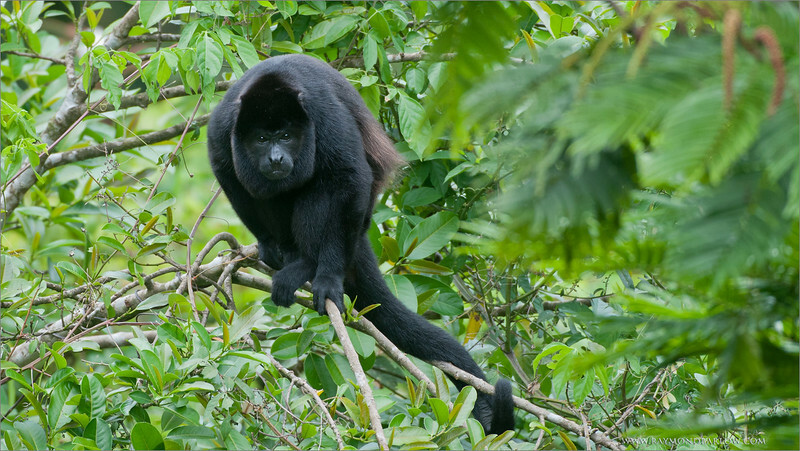 Thanks to my guests for another wonderful tour to this wildlife gem in Central America. 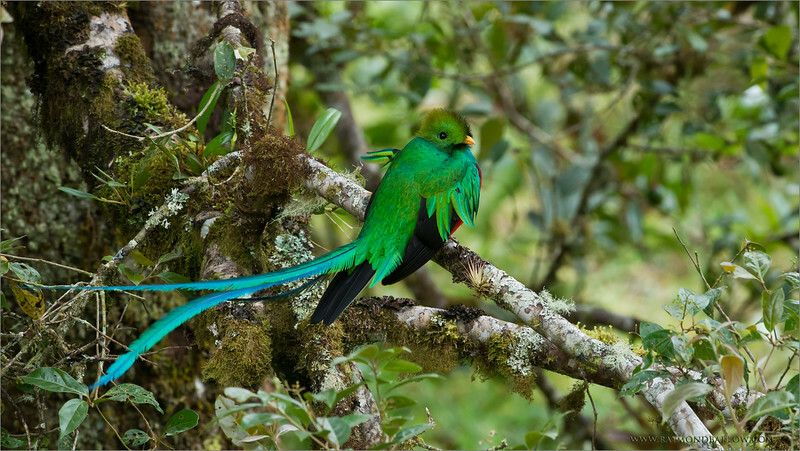 On a remote farm in the mountains of Costa Rica, we find a pair of nesting Resplendent Quetzals taking care of their babies. their families along side the farmers and their cows. A clear view on this nest was golden for everyone, I hope to post more images of the actual nesting later on., a few flight shots too. nearby, preparing to invade the nest for a meal. Nature at it's best, respect, and learning is always fun! Set up Photography - with 8 different Raptors in Flight! Working with a falconer - James Cowen, we create a scene during the workshop that will give our guests an opportunity to capture birds in flight with their cameras and lenses. All levels of photographers are welcome! I do a short demo, with the "how2's" and off we go into the training field. Everyone has a chance to capture each and every flight. 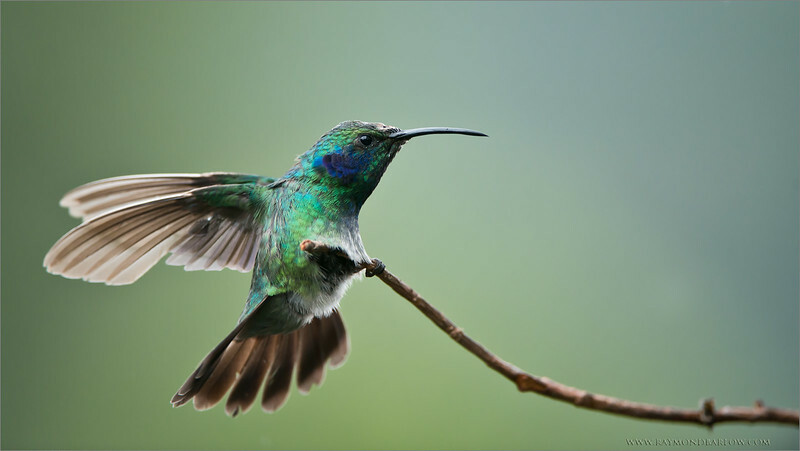 Some birds fly up to 25 times! We structure the set up to enable up to 10 photographers to get a good line, and fire as many images as they wish. this male performed like a gem, responding to the falconer like a dream come true! Fro more info, please email me any time! I leave Tuesday for a week+ in Costa Rica, but we will have another full weekend of workshops in May. Hope to see you in the field! A couple of good friends have kept me posted with news of this Great Horned Owl Nest, 2 babies being fed here, a large rat! Thanks to my sponsor Swarvoski Optics, this scope is amazing for long distance DSLR photography. With a crop camera, and the 95mm lens on the modular system, we have an effective reach of 1,340mm @ 30x - f9.5. This nest is about 60 yards from where I am standing, and about 30 yards up in the air. The adults nearby, patrolling the security of the nests, as there are many raptors in the area looking for an easy meal. 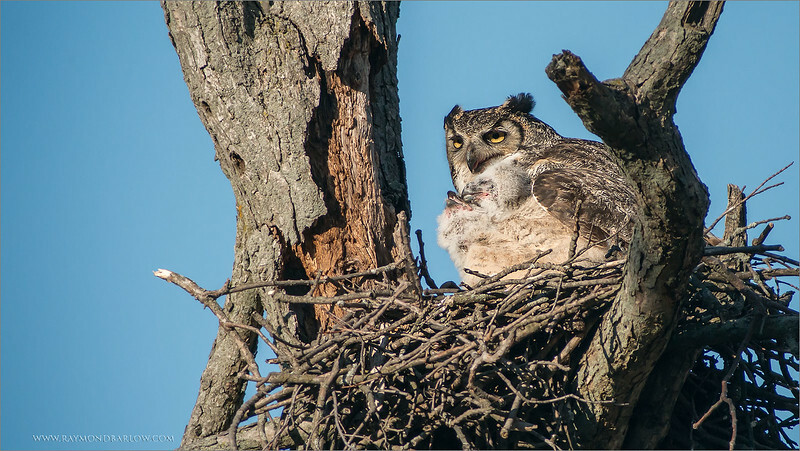 Keeping a good distance from the nest is the key to the success of the Great Horned Owls breeding season. Approaching too close could be detrimental to the lives of the babies. Respect for nature is always foremost on my mind, so keeping this location quiet is a priority. A red-tailed hawk makes the most awesome call! With her screaming for action, eager to fly for my group she impatiently jumps off my perch and arrives to her trainer in about 2 seconds! The lift off shot can be the most fun to catch., a dull day for light, high iso, some nr in photoshop, a quick crop, touch of sharpening, and we are good! This program is so much fun, people just keep coming back1 Usually 80% repeats! Thanks to everyone for the support, and good fun! 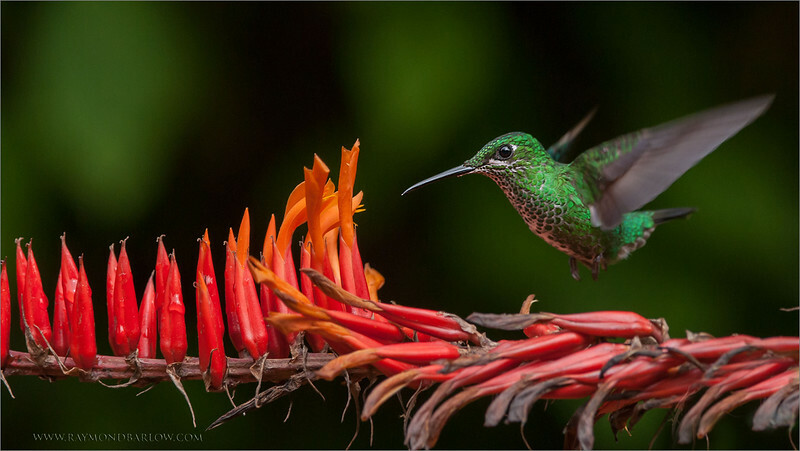 To capture this tiny bird at 1/8000 of a second. 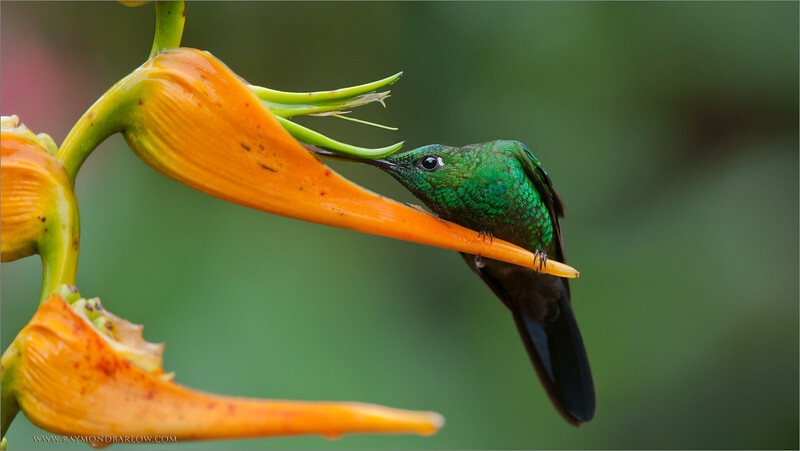 Not much bigger then a bumble-bee, this beautiful bird examined this flower intensely. About 80 beats per second, catching a bit of freeze in the wings is difficult during most conditions. Looking forward to one more tour coming up in 3 weeks... join us!! Brother and sister Kestrels posing for my group on Saturday, a great way to finish off a workshop. 10 guests Saturday, 10 for Sunday, and so many images taken! Thanks to everyone for joining these programs, good fun! To have such an opportunity! In our lifetime, we can experience some incredible places, people, and scenes. This eagle that takes flight for my guests in controlled conditions is nothing short of spectacular. My falconer friend James will start each bird (about 7 different species) where I ask him to, and have the bird fly - land where we want this bald eagle to land. What an opportunity! These birds are extremely well cared for, as they are show birds, prepared and trained to fly as requested. I create the flight plan, set the background, lift of perch, and landing perch... this all relates to several factors. The light direction and angle, the wind, and the appropriate background to suit the size and colours of the bird. Once in a while, it all comes together, and we get a shot! Thanks to everyone for all the support, 10 guests Saturday, 10 guests Sunday!! People from all over USA and Canada! thanks to you for looking, and for reading this far in my notes! 2 more Raptors in Flight workshops soon, 2 programs to Costa Rica, 2 programs to Africa, and 1 to Newfoundland!! take good care... life is good! And see this amazing bird float in the wind! 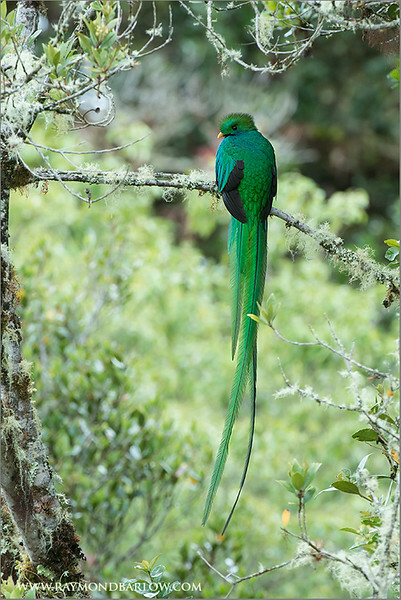 During my programs down south we might make as many as 3 trips to a private property to see the resplendent quetzal. A short hike into the mountain, sit and wait, and hope this awesome bird will join us for some imaging! Special thanks to everyone for viewing my images! !